When a theatre doesn’t have a performance or rehearsal, etc. it is said that the theatre is “dark. I’m writing this out longhand, with a favourite thick-barrelled ballpoint that is soon to break and be replaced with a Parker Jotter. The notes are on a yellow legal pad. This is the way that I used to write reports at school before committing to the labourious process of typing them out. My computer is in the shop. Which means that I must first apologize to the Genius Bar guys. They were right and I was wrong. Part of my optical drive burnt out, so my machine could read CDs, just not DVDs. It was a far more expensive issue than replacing a disk. I still maintain that service is dead. But for every rule there is an exception. Brandon, who helped me at the Short Pump Apple Store, remained very cheerful throughout the ordeal, mine and others’. His was customer service of the first order. He even found me a FedEx Kinko’s Office when I had to scan and email some photos immediately. He should be rewarded early and often. Both of the above anecdotes bring to mind something else that has just happened: The Model T Ocean to Ocean trip. I am aware of the trip because a friend of Mrs. E.’s is participating. I’ve written before about the need to slow down a smell the roses. My Bluetooth Jawbone headset broke a while back and I haven’t replaced it. Or missed it. A drive is more fun now, instead of being a time when I could return some phone call. The weather (until today, 17 July) has been temperate enough to drive with the windows down and the sunroof open, “Vince and Bola” playing on the stereo. It was this morning that the truth sunk in. To truly slow down, you’ve got to unplug. I wandered by my desk, looking at the empty cooling platform, the jumble of wires and general disorder and missed my blogging, my tweeting, goggling, commenting, in short, my internet. Missed it far too much. I cleaned up the desk, turned on the radio and sat down to set pen to paper. You must be more focused when writing with pen and ink. Writing uses different muscles. Mine are long out of shape. All writing is re-writing. Small faults and crossings-out will be corrected when this is keyed in. Writing and reading inspire reflection and contemplation. Much like taking a long, slow, open-topped drive across the country or a stroll around the block. I wonder if all this connectivity is disconnecting us? If focus on the small screen leaves us unable to admire the big picture? So, here’s your homework for the weekend (yup, that’s the kind of school I attended… .) Go somewhere today or tonight or tomorrow and just be quiet. Unplug, leave the cell, the Blackberry, heaven forbid the iPhone, behind and just be quiet. Or take a long slow drive in the country. Leave the tweets and chirps to the birds and crickets. But don’t get online. It’s starting to storm here. I’m turning off the computer and turning to a few articles that AGD sent me. Mr. Merkin is very diverting. And then I have a dinner party for which to prepare. The perfect plan for the weekend. I often write in longhand, especially when I travel. I feel somehow more connected. And a wee word of advice…The Genius Bar guys are always right. Love the Mr. Grant photograph. No one to beat him yet! 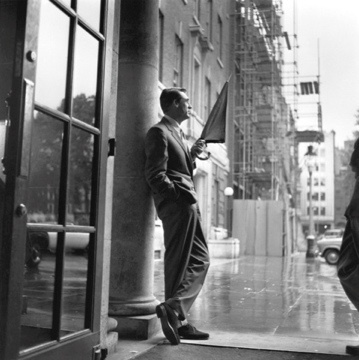 Cary Grant in any manifestation is always welcome. There are certain pleasures I know to count on and he is one. No matter how cynical, worldly, or jaded my life, he continues to take my breath away. I applaud the assignment and concur on your thoughts on writing in creating reflection and contemplation. For years, I kept journals and still carry a notebook with me everywhere to jot down things I read, see or think. There is so much that requires notation. But sadly, my reliance on a laptop has rendered my penmanship illegible. From time to time, I will scan through my notebook, spending whole minutes trying to make out the characters scratched on its pages. Perhaps it is time to take pen in hand for a turn around the track. What a great idea. I leave tomorrow for Bald Head Island with the family for two weeks. No cars, computers, etc. I do not plan to check in at the office either. I have a seminar in Raleigh and am meeting my family at the Southport port to catch the ferry to the island. That slow ferry ride to the island is as theraputic as your suggested slow country drive. I might even leave the seminar early, thrown on some classical music – Vivaldi perhaps – and take the back roads at a leisurely pace from Raleigh to Southport. I look forward to catching up with your blog next month. Great CG posts by the way. We named our oldest son Grant after CG. We had a dinner party here last night and I was nearly off-line for two days. Once the edgy twitching subsides you realize it just might be better. Hope your party was a good one. Thanks for the reminder. I’ve been on mild hiatus for a while because I felt I’d lost my focus and drive. I can feel them bubbling back now, in part because I’m about to get a laptop again. For me, the laptop has always been the electronic equivalent of the legal pads I used for years. Being tied to a desktop (and consequently one workspace) has stymied me. I write far better at the breakfast bar in the kitchen than I ever did at a stationary desk. Perhaps I should also clean up that old 1963 Parker fountain pen I used and get some ink while I’m at it. Hi Paul, I’ve got an extra bottle of Lamy blue ink that I’ll pass along! Welcome back.